The 35rd Annual Jump to It 10K Run, 5K Run/Walk and Kids Fun Run is a Spring favorite of many. Most of the course is along the beautiful shores of White Bear Lake. The out and back course is flat and fast and has seen state records in its long history. The location – Beautiful White Bear Lake and scenic Lake Avenue make the Jump to It an event you don’t want to miss. The West Park venue is inviting to all. Parking for this year’s event – There is quite a bit of road construction taking place around West Park . The best place to park is at Ramsey County Beach on the north end of White Bear Lake. Take Highway 96 to get there. 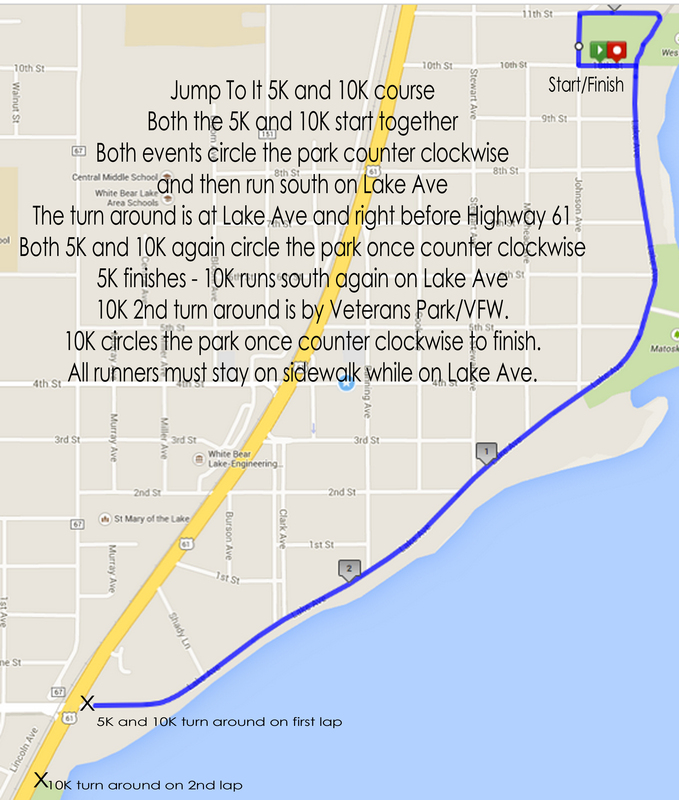 The course – “Flat and Fast” Out and back on Lake Ave.
T Shirts to all finishers. Results are Chip timed with Mylaps/ChampionChip. Online Registration Closes at Midnight Thursday May 2. There will be race day registration. Paper registration will continue through race day. No registrations will be taken over the phone. Cash, check, VISA and Mastercards are accepted on race day. 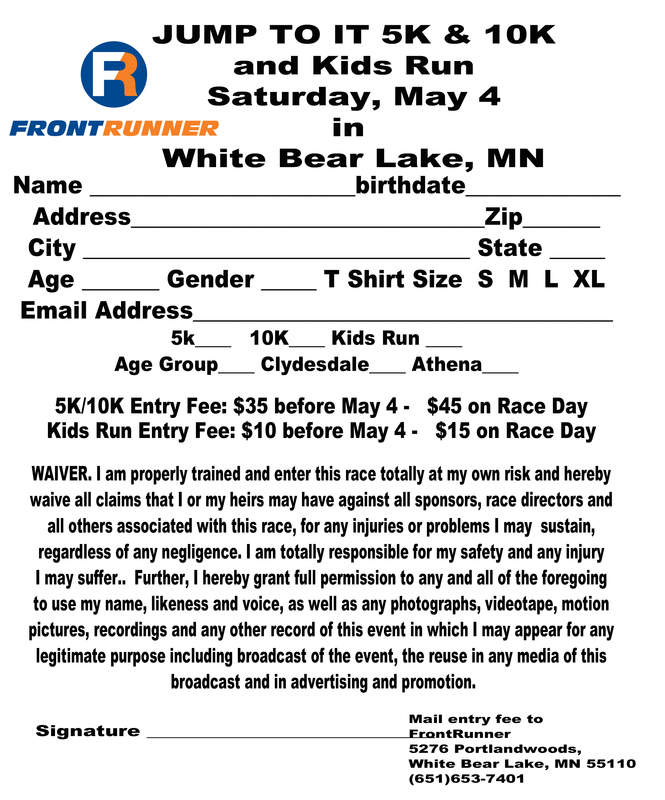 Friday, May 3 – Pick up your packet a day early at: FrontRunner, 1665 9th Street, White Bear Lake – Noon until 4:00 p.m. Parking: On-street where there is no road construction and also available at Ramsey County Beach on Hwy 96, East of Hwy 61. Please wear your bib number on the front of your shirt/jacket. You bib number contains your timing chip.